It is fair to say that the church owes its presence here to Judge Lutwyche. 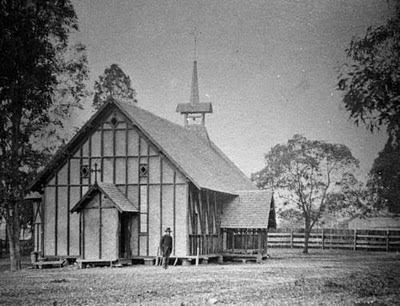 Lutwyche, a practicing Anglican, purchased the land on which the church stands in 1864 and donated it in 1865 when the local Anglicans decided to build a church. He and his wife participated in the planning of the church which was designed by RG Suter. Here is that church in a picture that was taken in 1888. 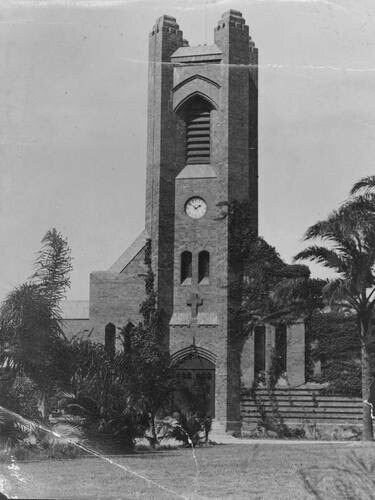 In the early 1920s the congregation decided to build a new church, which was opened in August 1926 by the Bishop of Brisbane and a crowd estimated at over 2,000 people. The second church is shown below in a photograph from 1939. Fortunately the church is well set back from busy Lutwyche Rd, because the Northern Busway has created traffic snarls, not to mention dust and noise issues (see next Monday's post!). However the church sits serenely amongst some carefully tended trees. The web site of the church can be found here, and it is interesting to note that both the rector and the deacon are female.